Being the most beautiful animal in the African bush doesn’t necessarily mean that leopards have it any easier. We were out on morning drive a few days ago, when we came across one of our big male lions lying beneath a Knob Thorn tree. It was already very hot so we didn’t think anything of it, but after a while we noticed that he kept glancing up into the tree. At first we assumed that he had a kill in the area, and was keeping a cursory eye out for vultures. There were none to be seen however, so we ruled that option out. 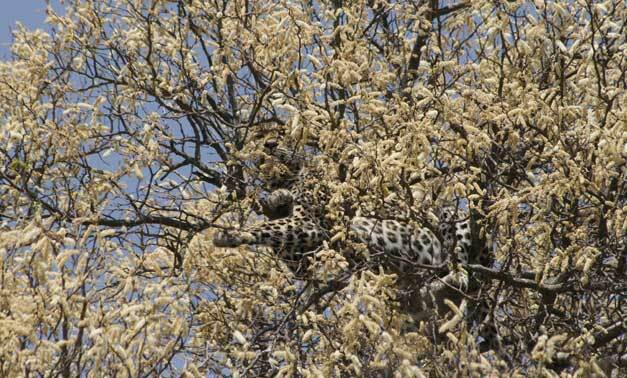 We then inspected the tree a second time, and that’s when we saw the male leopard perched in its uppermost branches. The reason we’d missed him the first time was because Knob Thorn trees are in bloom at the moment, and the light yellow flowers in the dappled sunlight made it almost impossible to see him. The stubborn lion did not leave his post for even a moment, and remained under the tree for the entire day. He only left late in the evening when the rest of the pride called him to dinner. Needless to say the leopard then made a hasty escape.